Lindsey Harding wasn't sure she wanted to coach, which is why she decided to join the Sixers. They gave her options and wanted her to grow. The Sixers are leading the way in the NBA when it comes to putting women in charge. Meet Lindsey Harding, player development coach, and read our other profiles here. “We’re not sportswriters,” the closer one replied. His jaw dropped. “Oh,” he said, and turned away. Before an April 4 game at the Wells Fargo Center, Lindsey Harding was joined by Dwayne Jones (left), a player development coach, and John Bryant, assistant coach. A pugnacious point guard at Duke and the No. 1 overall pick in the 2007 WNBA draft, Harding became the only female scout in the NBA and just the third in league history when she was hired by the Sixers in August. This week, she was promoted to player development coach, which made her the seventh female assistant coach in NBA history. Harding, 34, played for five teams in her nine WNBA seasons, and for seven European teams as well, finishing with Beşiktaş JK in Istanbul in 2017. At the urging of her friend Becky Hammon, who became the NBA’s first full-time female assistant when the Spurs hired her in 2015, Harding spent a year in the NBA’s Basketball Operations Associate Program and emerged with several job offers. The Sixers snagged her by promising her choices. “I think she’s going to be a star,” said Sixers head coach Brett Brown. Two Sixers executives said they think Harding could become the NBA’s first female general manager or head coach. Sit next to her for five minutes, and you’ll see why: She’s the type of hoops nerd who can carry on a conversation while staring at a player and analyzing his footwork. Lindsey Harding starred in the WNBA and in Europe before pursuing her next career in a front office. Which is how she spent the last six months. Harding rented an apartment in Philadelphia, but she she hardly saw it. She lived the exhausting life of a pro scout: four cities in four nights, three time zones in five days, her off days sometimes spent in Miami Beach, sometimes in a Cleveland health club, sweating out travel toxins, eating organic antioxidants. When asked last month about what her experience had been like, she couldn’t remember where she’d been in the 10 days since the All-Star Game in Charlotte, N.C.
Now that she’s a coach, her frequent-flyer days are over. She’ll travel with the team and work with young guards Zhaire Smith and Shake Milton. It is not her first foray into coaching men: She was on the Raptors’ bench in the 2015 summer league, when Hammon led the Spurs to the summer league title. Harding also spent part of the Raptors’ 2015 training camp with them in Vancouver. “It was kind of, like, I can do this!” Harding said, her face, framed by a cloud of tightly pulled-back hair, suddenly illuminated by a rare, brilliant smile. Lindsey Harding has lived the scout life for eight months now, traveling across the country and recommending players the Sixers should add to the roster. But she wasn’t sure if she wanted to coach when she stopped playing. That’s why she chose the Sixers. Does that path include recommending this season’s trades for Jimmy Butler, Tobias Harris, and Boban Marjanovic? But outside the Sixers organization, not everyone has that level of respect. She’s becoming irritated at having to justifying herself. Again. The reality is, Harding does face differences in her job — differences men don’t have to worry about. “They would look in the media pile and wouldn’t see my name. I’d say, ‘I’m a scout.’ "
Inevitably, Harding would feel the chills and the gravity of how important what she was doing for the women who came before her, who work with her, and who will come after her. “It makes me smile,” she said. “As many years as they’ve done that job, and they see me come through — I think it’s great. 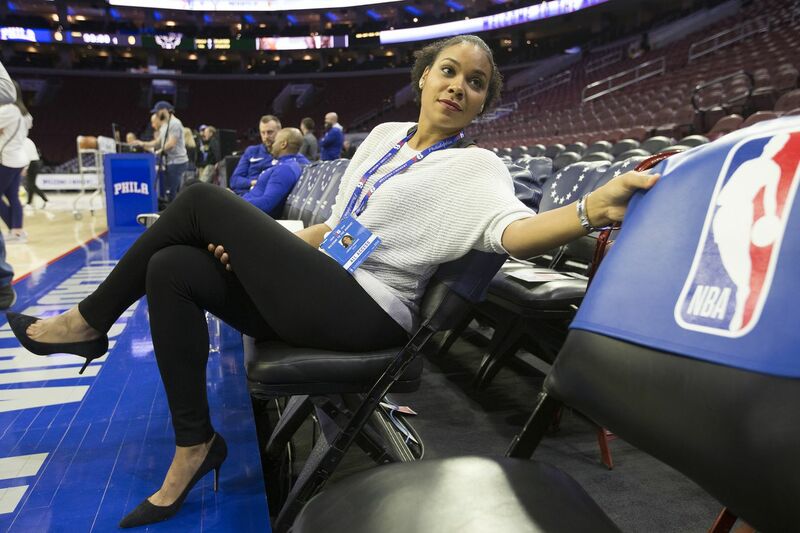 Lindsey Harding is making history once again, this time as the first female coach in Sixers history.